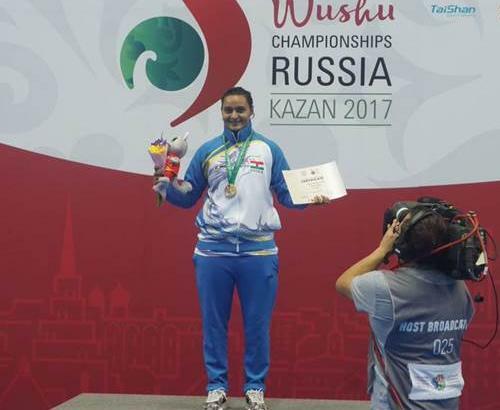 Pooja Kadian became the first ever Indian sportsperson to win a gold medal at the Wushu World Championship in Kazan, Russia on 5th October 2017. 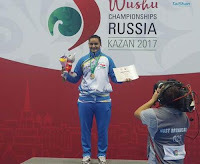 Apart from her, four other members of the Indian contingent – Rameshchandra Singh Moirangthem, Bhanu Pratap Singh, Rajinder Singh, and Arunpama Devi Keisham – won bronze medals in the tournament held at Kazan, Russia. Kadian had defeated Egypt’s Heba Abdelkader 2-0 in the semifinals on the road to the finals. Rameshchandra Singh Moirangthem won a bronze in men’s Sanda 48 kg category while Bhanu Pratap Singh came in the men’s Sanda 60 kg category. Rajinder Singh won his bronze in the men’s 90 kg category.